The Huskies won their 26th straight first-round game, beating Towson. 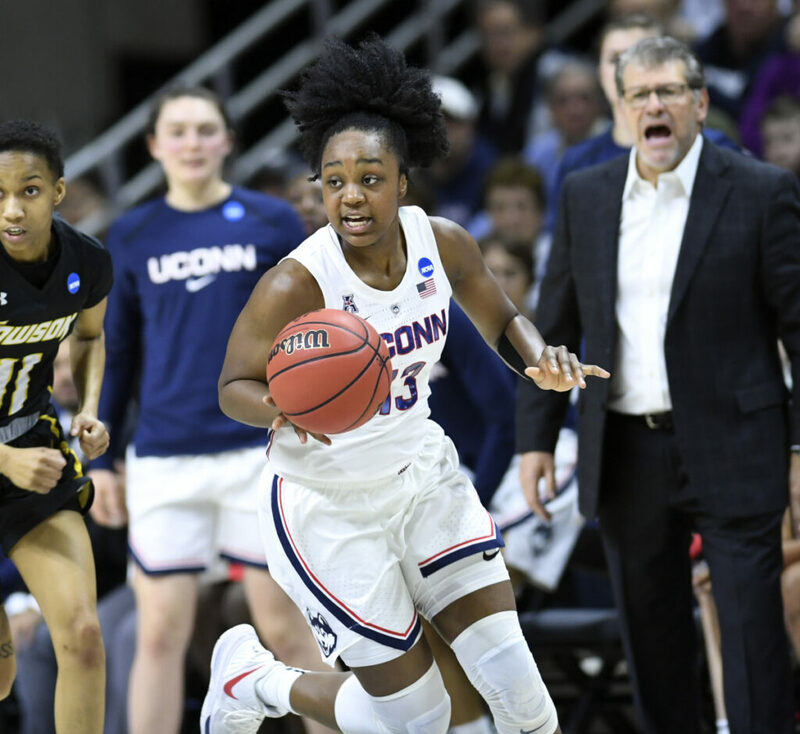 STORRS, Conn. — Napheesa Collier scored 23 points and UConn, in the unusual position of being a No. 2 seed, got off to its usual NCAA tournament start with a 110-61 rout of 15th-seeded Towson on Friday night. Kionna Jeter had 20 points for Towson (20-13), which was making its first NCAA tournament appearance. Connecticut has won 26 straight first-round games by an average of almost 50 points since a loss to Louisville in 1993. ARIZONA STATE 60, UCF 45: Courtney Ekmark scored 15 of her game-high 20 points in the second half as the Sun Devils (21-10) won at Coral Gables, Florida. Ekmark opened the game with a 3-pointer, then opened the second half with a pair of 3s. Those two quickly turned what was a 10-point halftime lead to a 16-point edge. IOWA 66, MERCER 51: Megan Gustafson scored 30 points with 16 rebounds and the Hawkeyes (27-6) narrowly avoided a monumental upset, holding on to win at Iowa City, Iowa. SOUTH CAROLINA 74, BELMONT 52: Te’a Cooper scored 13 points, Alexis Jennings added 12 points and the Gamecocks (22-9) won at Charlotte, North Carolina. FLORIDA STATE 70, BUCKNELL 67: Kiah Gillespie had 17 points and 11 rebounds, and the Seminoles (24-8) held on to win at Charlotte, North Carolina. MISSOURI 77, DRAKE 76: Jordan Roundtree hit a free throw after being fouled with 1.1 seconds left in overtime as the Tigers (24-10) won at Iowa City, Iowa. LOUISVILLE 69, ROBERT MORRIS 34: Asia Durr and Sam Fuehring each had 19 points, and the host Cardinals (30-3) scored 27 straight points in the first half to overwhelm the Colonials. MICHIGAN 84, KANSAS STATE 54: Naz Hillmon scored 17 points off the bench, Nicole Munger and Kayla Robbins each added 13 and the Wolverines (22-11) shot a season-high 56 percent to win at Louisville, Kentucky. BUFFALO 82, RUTGERS 71: Summer Hemphill scored 23 points and Cierra Dillard added 20 as the Bulls (24-9) upset the Scarlet Knights at Storrs, Connecticut. TEXAS A&M 84, WRIGHT STATE 61: Chennedy Carter scored 27 points in her return from injury, 14 in the first quarter, to help the Aggies (25-7) win at College Station, Texas. MARQUETTE 58, RICE 54: Natisha Hiedeman scored 13 points, Allazia Blockton had 12 and the Golden Eagles (27-7) overcame a nine-point fourth quarter deficit to win at College Station, Texas. CLEMSON 79, SOUTH DAKOTA 66: Simone Westbrook scored 27 points, Danielle Edwards added 25 as the Tigers (20-12) pulled away in the fourth quarter to win at Starkville, Mississippi. INDIANA 69, TEXAS 65: Jaelynn Penn had 24 points and Bendu Yeaney added 17 to help the Hoosiers (21-12) surprise the Longhorns (23-10) at Eugene, Oregon. Brenna Wise and Ali Patberg contributed another 10 points apiece for the Hoosiers, who were making their first appearance in the tournament since the 2015-16 season. Danni Williams led Texas with 15 points.